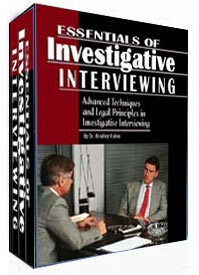 A complete framework of investigative interviewing and interrogation and the legal principles that apply to interviewing people to develop the needed admissible evidence. Proper approaches and psychological elements of the interrogation process and how to conduct them successfully. This chapter reveals extensive methods and techniques you can utilize in the interviewing process to obtain the information you need to develop. Various forms of approaches and methods are described which have been used successfully by the author to obtain evidence from people even from subjects who would normally be considered unwilling. This chapter deals with the measurement of responses from a subject of an interview and/or interrogation and can be used quite successfully to detect deception. This chapter deals with the psychological aspects of developing your interviewing skills as well as psychological aspects of your subject so you can utilize these principles to obtain better interviewing results. This chapter shows you how to utilize pre-interview research to make your interview much more successful. By understanding and employing different approaches to the investigative interviewing process based on the subject matter and the subject, you'll find better content on the information you are after. This chapter exposes those successful secrets used by the author. This important chapter explores the ground work and agenda of the interview and shows you how to stimulate responses and develop the actions and reactions you are after. This section gives you a number of specific types of interviewing settings centered around criminal activity.